You have got to be kidding me. Does it include its own spindle? Baltimore’s an odd little city in some ways. For one thing, who thought it was a good idea to put a large convention center across the street from the baseball stadium? Throughout Otakon, cosplaying anime fans and befuddled Orioles fans competed for space on the sidewalks. But maybe it’s not so bad that the stadium is so close to the convention center, because the Sports Legends museum shares a building with a great find for any fan of vintage Disney comics and merchandise: Geppi’s Entertainment Museum, which a friend was kind enough to suggest we visit that afternoon. Geppi’s Entertainment Museum is dedicated to presenting the story of popular culture since the nation’s earliest days in an entertaining and educational fashion so that our guests have the unique opportunity to walk through a timeline that parallels and is entwined with history as a whole. My only disappointment in the museum is that their Local Heroes collection only has a small John Waters section. Museum staff explained that this is because they’d like to keep the museum family-friendly, which means they really can’t reference most of his films (they did have a couple of pink flamingos, referencing his least family-friendly movie). 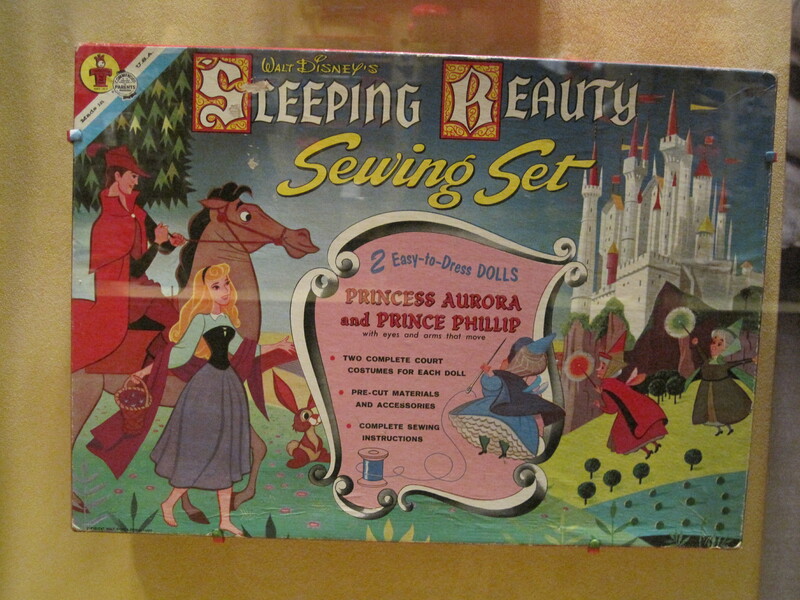 Below is a photo gallery of just a few of the Disney items I saw at the Geppi Museum on July 26, 2012. If you’re in Baltimore, with or without tens of thousands of anime fans, I’d encourage you to drop in and visit the collections. I’ve also got to include one non-Disney image, because it makes me giggle. 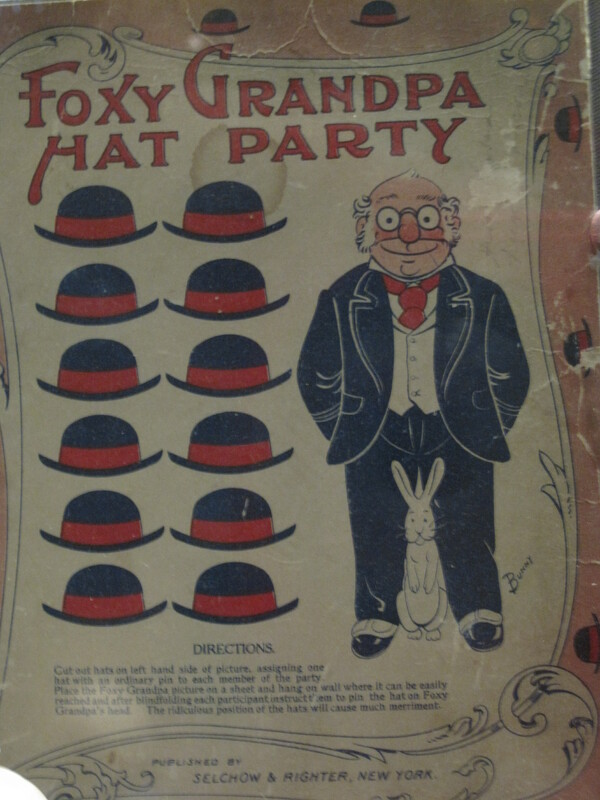 If Foxy Grandpa Hat Party isn’t already a euphemism, it should be. Watching The Chain Gang this morning made me wish even more that we could see old-school hard-times Mickey Mouse facing today’s economic troubles. When we see him next in The Picnic, also released in 1930, his name is Rover. Plus, he’s Minnie’s dog, not Mickey’s, as my friend Eliyanna points out in an early episode of Those Darn Cats, A Room of Minnie’s Own. When The Moose Hunt is released, the pup is now named Pluto, and belongs to Mickey. 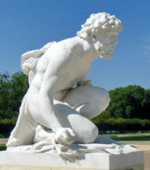 The name Pluto was proposed by Venetia Burney (1918–2009), an eleven-year-old schoolgirl in Oxford, England.Venetia was interested in classical mythology as well as astronomy, and considered the name, that of the Roman god of the underworld, appropriate for such a presumably dark and cold world. So there you have it, kid. The best I can tell you is that Mickey’s dog is named after the Roman god of the underworld? Because Venetia and Ben said so. But Eliyanna, I still don’t know why Mickey stole Minnie’s dog. we ultimately do not choose who we are, we can only choose whether to embrace or resist. pleasure and joy are important parts of the spiritual journey. it is not in my child’s best interests to be sheltered from every possible frustration. love is not enough, but it is in fact an essential ingredient. And now, I must tag five people! Lisa, Dani, Bonnie, Doc Terminus, and La Pixie. And hey, while I’m mentioning Mr. Broke Hoedown, I cannot resist shamelessly plugging this week’s Those Darn Cats, which features a discussion with Mr. BH about the World War II propoganda and entertainment videos in the DVD Walt Disney Treasures: On the Front Lines. Personally,I’m waiting for Disney to release “The Story of Menopause,” even if it is a cheapquel. I’m not getting any younger here, y’know. And in response to a question posited by a BoingBoing reader….no, young men should not head out to recess while we ladies watch the film. Stick around and get learned. How’s this for cool? 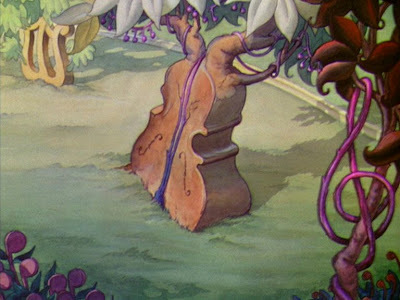 The Animation Backgrounds blog has a bunch of beautiful images from Cinderella, Bambi, and a bunch of other Disney (and other) flicks. I like the one above, from the 1935 cartoon, Musicland. There are also some stunning images from Pinocchio. Hat tip: Dark Roasted Blend. Hat tip: Cartoon Brew, via Disney History. Toy Box Series, Episode 3: Picture Book 1936” (Omocha-Bako Series, Dai-3-Wa: Ehon 1936) is a 1934 propaganda-ish film about a future (1936) conflict started by a swarm of evil, bat-riding Mickey Mouse clones that descend on a tiny island inhabited by peace-loving dolls and cats (including a Felix lookalike). Overwhelmed by the attack, the desperate island residents bang on the cover of a large picture book to enlist the help of Momotaro, Urashima Taro (the Japanese version of Rip Van Winkle), and other traditional fairy tale heroes and characters. And hey, speaking of anime . . . this week on the MouseGuest Weekly podcast, Dan! put out a call for anybody interested in a MouseGuest mini-meet at Anime Boston next month, maybe noon Saturday at a nearby coffee shop (so those who aren’t registered for the anime con can still bask in the company of their fellow MouseGuest listeners, and maybe a Broke Hoedown reader or two). If you’re interested in getting together, drop a note or leave a comment here to let us know if that day/time works for you.